Banaras Hindu University is one of the most pioneer university in India. Many of us are aspiring to become a part of BHU. 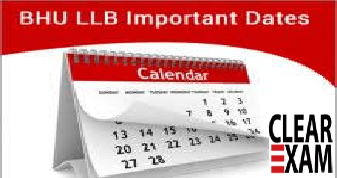 In Legal Profession, BHU offers LLB and LLM Degree Courses. In this article, we will talk about all important dates related to the law entrance exam for admission to three year and five year LLB program which will be conducted by the Banaras Hindu University. First thing to keep in mind is that you have to fill the forms online only and the official site will start showing the application forms when the start date of filling application forms is here. This date of beginning to fill the application forms is January 2018 last week. Point to note is that this date is tentative and you will be notified when the final dates are announced. This marks the beginning of the admission procedure and you can fill the forms till the last date which is somewhere around February 2018. Then comes the application fee. The application fee for the general category is Rs 500 and for reserved category is Rs 250. The application process is not complete till you pay the fee. You can pay online through debit or credit card or offline through a bank challan payable at any branch of HDFC bank. This should also be done on/before the last date which is around February 2018. Now once you have filled the application forms what the next step is that you will be issued admit cards and you have to download and print them out. The admit cards will be issued seven days prior to the exam and if there are three days left for the exam and you haven't been able to print the admit cards then you have to inform the controller of exams on the phone number or email id provided on the official website. Finally, it comes for the time for the exam. The exam will be held somewhere around third week of May. The next step is release of answer key. This will take place around last week of May which means just a week after the exam you will have the answer key in your hands and you can check how many questions you answered correctly and how many wrong and the score which you will be getting. How you can download the answer key is by visiting the official website which is www.bhuonline.in and going to the section which says " view provisional answer key". Clicking on that tab will open the file and you can match your answers as against the answers provided in the document. Next comes the crucial time for results. You will not have to wait for a long time for the results and the same will be declared in June 2018 first week. You will get the results in the form of a scorecard which will be declared on the online official portal. Once the results are declared then comes the turn of cut offs. Your score matters when taken into account with respect to how others fared in the exam. The cut off decides the minimum marks one should have obtained in order to qualify and earn a seat in the university. Cut off also depicts the closing rank at which admissions stopped and the last rank at which admission was granted. Cut offs will be declared around the same time when results are declared which is June 2018 first week. Last step in the admission cycle is time for counseling. This will take place around third week of June. Here all your documents will be verified and if found valid and original then on the basis of your score and merit rank and subject to the availability of seats you will be given admission to the law program of Banaras Hindu University.